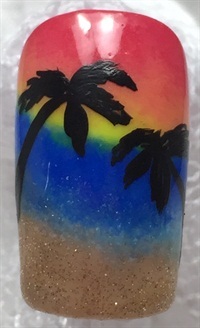 Jen Fetty of Middleton, Idaho, shows how to make this beachy nail design. 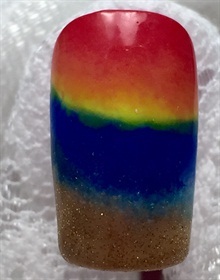 Jen Fetty (@jenfetty) of Middleton, Idaho, shows how to make this beachy nail design. 1. Clean and prep the nail. Apply Gelish foundation.Cure in LED light for 30 seconds. Sponge on colors to make the beach, water, and sunset. Cure for 30 seconds in LED light. Repeat sponging until you get the patten and vibrance to your liking. 2. Apply top coat and cleanse the nail. 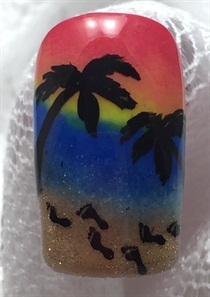 Paint on palm trees with black acrylic paint. 3. Stamp footprints with a nail stamp. Add top coat and cleanse.